Beguru: The beautiful 1970 movie love story ‘Sunflower’ starring two hugely talented Italian actors Sophia Lauren and Marcello Mastroianni that tells the tale of World War II, brings back memories of the Sunflower fields. Here Giovanna played by Sophia Lauren goes in search of her husband Antonio,( played by Mastrioianni) to Russia where she visits the Sunflower fields. 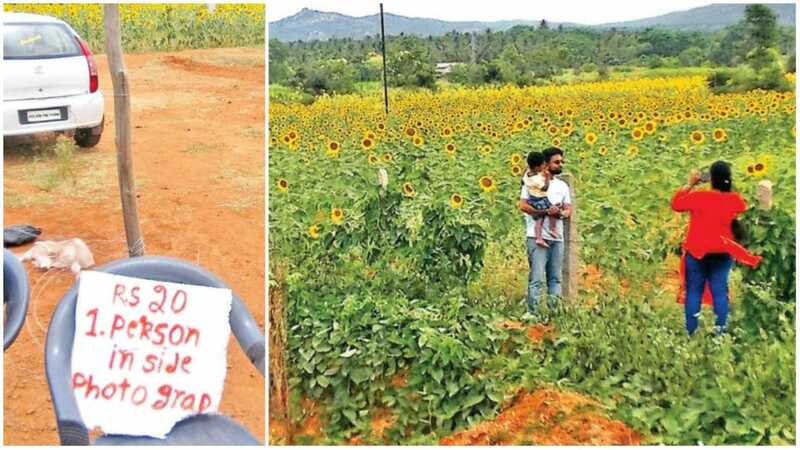 Similarly, a Sunflower field in Beguru by the National Highway in Chamarajanagar district is attracting the attention of the people driving in cars and two wheelers. But the situation here is quite different. Due to lack of rain and mounting debts, the farmer here is trying to find new means to augment his income. The sunflower (which also is the theme of famous Dutch painter Vincent Van Gogh) he has grown in his fields next to the NH 766, is attracting people driving on the highway. They are stopping their vehicles and clicking selfies and posing for photographs in the lush field full of bright yellow sunflowers. In the beginning, farmer B.K. Sundar was allowing the visitors to enter the fields and take pictures. But he realised over a period of time that this was causing problems as they would stamp all over the field and damage the flowers. During the Ramzan festival recently, tourists from Kerala came in hordes stopped at the field and took selfies by paying Rs. 20. Then they are sharing the photos on Facebook and Whatsapp with their friends and family members. Grabbing the business opportunity, a few more entrepreneurs have set up shops selling tender coconuts, ice creams and other eatables. When the rush dwindled, he brought down the rate to Rs. 10 and by 4 pm yesterday, Sundar had collected Rs. 1,000.